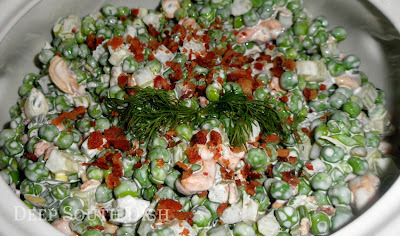 A heritage recipe, English Pea Salad is made up of frozen or canned peas, mixed, at minimum, with celery and onion, and dressed with a mayonnaise or sour cream based dressing. I've added some bacon, dill and chopped boiled eggs in mine here, but it's wide open for personalization. Cold Pea Salad is another holiday dish you may remember from your grandma's kitchen during the major holidays. Called English Pea Salad, it's more widely known these days as simply Cold Pea Salad, and is a long held holiday favorite, though it's really a great side dish for anytime of the year. We were chatting about Pea Salad over on the Facebook page right around Thanksgiving and all of the different variations everybody makes. When I had a baby shower to go to this past weekend, I thought it would be a nice dish to bring and get posted before Christmas. Pea salad is probably one of those dishes that isn't nearly as appealing to the younger crowd as those of us who've been around a bit, so to be honest, I was secretly hoping there would be enough left for my lunch the next day. As it turns out we had plenty of food, ate plenty enough, and had leftovers too, so I was a happy gal! 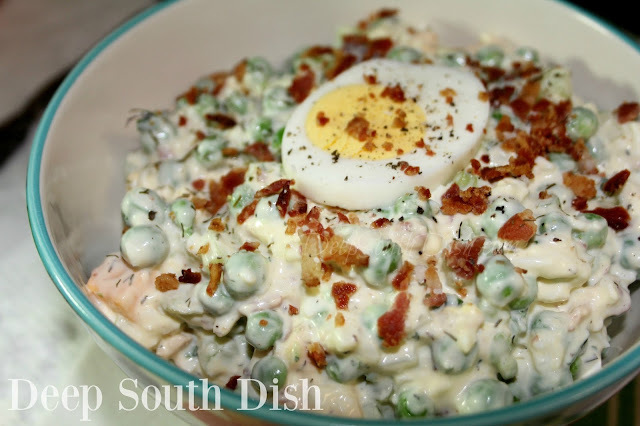 To enjoy this salad, it helps if you're a fan of peas, which I am, though I have been told by some folks that family members who won't eat peas, will often eat a pea salad. Unless you're my husband who will, almost reluctantly, eat peas when I set them before him, but isn't remotely interested in pea salad at all. In his defense, he's not much of a salad eater to begin with though. His idea of salad is iceberg lettuce with French dressing, though I don't let him get away with that either. A traditional Cold Pea Salad will almost always begin with frozen or canned peas, celery, onion of some kind, and a dressing of mayonnaise, sour cream, or a combination of the two. It's also very good with a sweet and sour dressing of vinegar, oil and sugar, and some folks like it with a coleslaw dressing or old fashioned boiled dressing. From there, much like a pasta salad, you can customize it to your liking. Pickle relish, chopped hard boiled eggs, and diced or shredded Cheddar cheese are almost always the typical add-ins. I've kept the base recipe pretty basic, but included those add-in suggestions and others that were shared by Facebook readers in the Cook's Notes at the bottom. Get creative, have fun and make it your own! In a medium sized storage bowl, beat the sour cream with the mayonnaise to loosen it, adding the sugar, salt and pepper; set aside. Cook the bacon, crumble and set aside. Reserve a teaspoon for garnish. Add the peas to the dressing. Add the cheese and celery. Add the red or green onion, dill and bacon. Gently fold ingredients into the dressing and add chopped egg if using. Once mixed, cover and refrigerate until ready to serve, allowing 30 minutes for salad to come to room temperature before serving. Transfer to a pretty serving dish and garnish. For the dressing, beat the sour cream with the mayonnaise in the bottom of a lidded, medium size storage bowl, adding the sugar, salt and pepper; set aside. Cook the bacon, crumble and set aside, reserving a teaspoon for garnish. Add the peas, cheese, celery and green onion. Reserve a sprig of dill and slice of boiled egg if using, for garnish. Add the dill and crumbled bacon. Gently fold ingredients into the dressing and add chopped egg if using. Once mixed, cover and refrigerate until ready to serve, allowing 30 minutes for salad to come to room temperature before serving. Transfer to a pretty serving dish and garnish. Cook's Notes: I used Pictsweet Deluxe brand frozen baby sweet peas. May also substitute two well drained cans of peas; I recommend Petit Pois or LeSueur peas though common green peas are also fine. If using canned, drain well and wait to add them at the end instead, tossing gently so as not to mash the peas. May substitute chopped yellow onion for the red or green onion and can also substitute all mayonnaise or all sour cream. I also like to add a tablespoon of Ranch dressing, or about 1/3 of a packet of the dry seasoning. Optional Add-ins: Diced apple, chopped cashews, pecans or walnuts, chopped boiled eggs, chopped pickles or pickle relish, diced firm tomato, diced ham, chopped bell pepper, and/or chopped pimento. Optional Sweet and Sour Dressing: Combine 1-1/2 cups of granulated sugar, with 1 cup of vinegar and 1/2 cup of extra virgin olive oil in a saucepan. Bring to a boil until sugar is well dissolved. Pour dressing over the salad, mix well and chill several hours or overnight. I really like this dish but haven't had it or even thought about it in years. The recipe sounds delicious but I can't seem to find the Slap Ya Mama in it - must be a typo. Haha Larry, I really don't put it in EVERYTHING I swear!! ;) Not to say, of course, that it wouldn't benefit from it. Merry Christmas!! What does your Grandma's recipe have in it? Please share!! Over the years, I would never eat this as I HATED peas. However, in recent years, I have come to like fresh or frozen peas. There is a world of difference between fresh/frozen peas and canned peas. I may try this with fresh/frozen, but NOT canned. So, for those who aren't sure, try fresh or frozen. do you cook the frozen peas? Kit, frozen peas are also my preference for salads like this. They just hold up better! Anonymous - you do not cook the peas - just thaw them! I used to run a Deli and I made this for the case but was made fun of and told I was so country, the only thing is I never once threw any of it away. The only thing I put in that you don't is shredded cheese, what ever I have left over I added to the mix and as a topping. I also serve it with everything, hamburgers, hot dogs,fried chicken, meat loaf, etc, etc. It's great with anything. Deniece is right. Gotta have the cheese! oh and Miracle Whip instead of mayo...no celery, though. Dang! I'm gonna make some o' this right now! Kit I find that my tastes have changed over the years too. For instance, I used to almost hate coconut but now I love it! Merry Christmas to you too Roz! Deniece, I'm not surprised at either of those - that some folks just do not get pea salad, or that you sold out of it all the time! You're right it does go well with pretty much anything! I did add cheese in the add-ins at the bottom - I actually love it with tiny cubes of cheddar added! Oh and if somebody calls me "country" I say thank you!! Really messes with them LOL!! My granny made this on a regular basis. She always added finely chopped boiled egg and sometimes tiny pieces of ham. Nothing was ever bigger than the peas, which were tiny. Can't wait to try this on my own. I'm moving out of Texas to Canada soon and am so glad to have found your recipe blog! Hi Amy! Wow, that's gonna be quite a transition for you. I'm so glad you found us too & hope you'll continue to visit for your southern recipes & share them with your new Canadian neighbors. Welcome! Hi and thanks for sharing this. I'm here in the deep south of India and have never tried (let alone heard of) this dish before. I've just tried it out - but with dried/soaked/cooked-for-ages peas instead of frozen. You do get frozen peas here, but I thought I'd try these as I already had them (they look nice with all the lentils in my tupperware!) After I discovered that the bottle of mayonnaise in my fridge was actually tahini, I decided to go with ranch dressing. Chopped some onions and some experimental "pickled veggies" that I'd made with red grape vinegar (carrots, red bell pepper and more onions) and mixed it all together with sugar, salt and pepper. Had a taste just now before popping it in the fridge for tomorrow's lunch (it's midnight now) and it doesn't taste half bad! Looking forward to lunch tomorrow, thanks to you! Sounds like some great adaptations - I hope you enjoyed it!! Oh yeah, definitely pay for the convenience but it's pretty easy to do your own too! Pimento is a nice addition! I've included it in the recipe add-ins. This delicious pea salad sure did go great with your Old School Oven BBQ Chicken we had for dinner tonight! I especially like pea salad during the summer, it's very refreshing to me during a hot and humid summer in the south. I decided to use the red onion as I have only had pea salad with chopped sweet onions. My family always made it that way and I guess I didn't pay much attention. But I really liked the red onion and will be using it again next time. Thank you for sharing, our dinner was excellent!